We get asked a lot of questions about homemade cat food and homemade cat food recipes. People want to know whether homemade cat food is safe. People also want to know whether raw food is better than cooked food when it comes to feeding cats at home. We do have the answers, and we’ll give them to you, but we’ll also start with a note of caution. You should only attempt to make homemade cat food if you’re confident you know what you’re doing. Poorly balanced diets are one of the biggest threats to a pet cat’s mortality. You may have heard people say that shop-bought cat food isn’t ‘natural’, but the reality is that both wet cat food and dry cat food have been carefully formulated to fulfill your cat’s complex nutritional needs. It is possible to make great homemade cat food, and if you want to find out how to make cat food you’re about to find out. Just pay close attention to the ingredients, and make sure you’re not giving them too much of one thing and not enough of the other. We can’t stress this point enough. 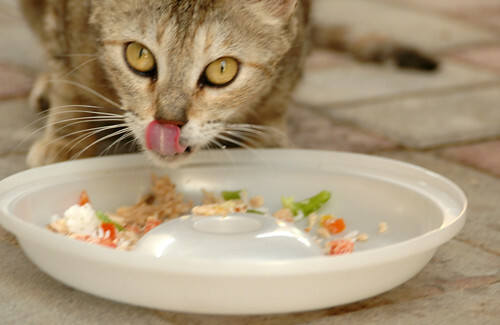 Almost everything your cat ingests through manufactured cat food is there for a reason. Cats will eat almost anything you put in front of them, and sometimes that’s to their detriment. If you only feed them one thing, they’ll happily eat it forever and probably never notice they’re getting ill. The responsibility to monitor what’s in every dish you serve them is yours, and yours alone. This picture gets even more complicated when your cat gets a little older, or if your cat is a little exotic. That’s why breed specific cat food and cat food for older cats exists. We recommend consulting with your vet before you start making homemade cat food. They’ll assess your recipe plans with you, assess your cat, and let you know if they think it’s a good idea. Your cat’s health is too important to take risks with. We’ll assume you’ve done that and got the all clear, so let’s talk about what has to be in the food. Protein is where we’re starting, because it’s the most important aspect. The bulk of protein a cat ingests comes from meat. 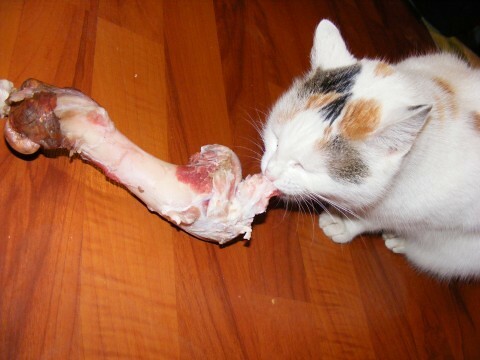 Cats are carnivores. If left to their own devices in nature they will always choose to eat meat. We know people do enforce vegetarian diets on cats, and we accept it’s possible. We’re just saying that they wouldn’t be vegetarian if they had the option! Your homemade cat food recipes should include meat or a really great protein substitute. An imbalance of protein will play havoc with your cat’s amino acid levels. As you’ve probably guessed, that isn’t good. Just because something has the word ‘fatty’ in it doesn’t mean it’s bad! Cats, like humans, need a certain level of fat in order to survive. The specific acids you’ll want to monitor your ingredients for are linoleic acid and arachidonic acid. Cats need both of them, but can’t produce either naturally. They rely on food to provide it, and fish are often a good source. As we’ve already covered, amino acids work hand in hand with protein in your cat’s body. Taurine and arginine are the two you’ll most likely come across, and the easiest to provide. Cats need a whole range of vitamins and minerals in order to stay healthy. Some of them have aesthetic purposes, like ensuring that a cat maintains a glossy coat. Others play more health-critical roles, like assisting your cat with maintaining a healthy temperature. Magnesium, calcium and phosphorous are all vital to a cat’s diet, as are Vitamin A and Vitamin B. Some of these ingredients can be provided by cat supplements, but not all of them. Raw Cat Food Or Cooked Cat Food? There are so many opinions about this on the internet that we’re taking a risk just by getting involved in the debate! Here’s what we think, though. At the risk of appearing to be sitting on the fence, we think you can serve you cat either option, and as long as the nutritional balance is right you’ll be fine. We know that sounds like backing out of making a decision, but science is on our side. Is Raw Cat Food Safe? As humans, we have hard-wired beliefs that raw food is bad for us, because that’s what we’re taught when we’re growing up. We, however, are not cats. A cat’s digestive system works very differently to ours. Consider how feral cats live. Also consider that cats used to live in the wild, and hunted their prey. They didn’t have a stove nearby to cook it on. Cats can safely live on a raw food diet. It isn’t the fact that the food is raw that’s dangerous to them, it’s the potential that there could be bacteria or disease in the food that can lead to problems. If you’re in charge of providing your cat’s raw food, and you’re buying it from a trustworthy sauce, you’re eliminating this risk. Just ensure you prepare it safely, and everything should be fine. 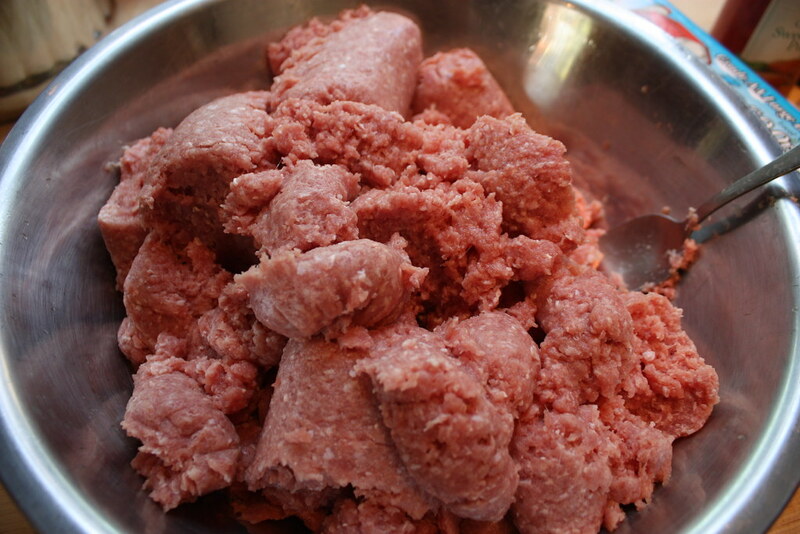 Do not purchase pre-ground meat – you don’t know where it’s been ground, or how. Grind it yourself. Take complete ownership of putting your cat’s raw meal together, and you’ll have less reason to worry. Doesn’t Cooking Cat Food Remove The Nutrients? Some, not all. There’s no denying that any cooking process is capable of destroying proteins. At the same time, though, it also kills bacteria and other nasties that can be lurking within the food. Your cat may be getting less of the good stuff, but it’s also getting none of the bad stuff. The key to successfully providing cooked food to your cat is not blitzing it in the oven. You should cook the food gently – or consider baking it – to preserve as much of the natural goodness as possible. Bacteria will perish at a comparatively low temperature. Nutrients will survive much longer. Find the happy medium, and don’t go higher. Ultimately, cooked food is completely safe, and well-controlled raw food is mostly safe. Those are facts. If you want to argue in the comments (and we suspect you might), please go ahead! A Meat Grinder. We mentioned above that you shouldn’t buy pre-ground meat. You can’t vouch for the cleanliness of whatever was used to grind it. You can, however, vouch for the cleanliness of your own. That means you have to have one, and you have to keep it clean! A Strong Blender Or Food Processor. Cats will happily gnaw away at chunks of food, but their mouths are smaller than ours. You know from handling wet cat food that it has an almost paste-like consistency. That’s because it’s been through a food processor. Not every recipe requires a food processor, but many of them will. That means you need one in your kitchen. Mortar And Pestle. Some of the vitamins and minerals your cat needs just don’t occur naturally in the food you want to give them. That means we have to get them into their diets another way. The most practical route is grinding up vitamin supplements and sprinkling them into the mixture. To do that, you’ll need a mortar and pestle. If you’ve got all of the above, it’s time to grab your cat chef’s hat and get to cooking! Here are some great cat food recipes. Let’s start off with something really easy. We’re yet to meet a cat that didn’t like sardines. Just the smell of it alone is enough to get most cats animated. Making sardine cat food is very straightforward. It has a consistency like normal wet cat food, and it can even be kept for a while after it’s been made. Half a can of sardines in oil. The better the quality, the better for your cat. Two tablespoons of mashed, cooked carrot. Get them down to a nice, pulped consistency. One third of a cup of cooked oatmeal. This is essential for both the consistency and texture of the food, and also for the nutritional content. You won’t believe how easy this is. All you need to do is pour all of your ingredients into a bowl, mash them all together until they’re thoroughly mixed and soft, and then serve them. That’s it. It should be soft to the touch, smell strongly of sardines, and easy for your cat to break up into chunks. If your cat doesn’t finish it all straight away (or you choose to serve a smaller portion), you can safely store it in your refrigerator for a few days. Our advice would be to throw it out if it’s there for longer than three full days – any longer and you run the risk of it going off. We know that earlier on we said that cats are carnivores, but we also said it’s OK to serve them vegetarian food so long as you get the nutritional balance right. This recipe has the kind of nutritional balance a cat needs. Admittedly, we’re going to cheat a little bit by introducing a little chicken or fish stock for both taste and protein purposes. It’s sometimes nice for a cat that doesn’t get to go outside and chew at the plants to have a little greenery on its plate, and this recipe caters to that desire. One quarter of a cup of grated zucchini. One eighth of a cup of fish or chicken stock. This is your choice. We appreciate that some of you will consider fish to be more of a salad ingredient than chicken, and so you’re free to go that way if you choose. Half a cup of chopped alfalfa sprouts. One eighth of a teaspoon of minced catnip. This will be used as a garnish, and a bit of a treat for your cat.They don’t often encounter raw catnip in shop-bought food or treats, so this meal will likely be a popular choice with them! Again, this is simple. We’re getting a couple of easy dishes out of the way before we move on to anything more difficult! The first thing you need to do is put all your ingredients into a bowl, and toss them until they’re well mixed. When you’re satisfied that they’ve come together into a recognizable salad, simply put them from your bowl into your cat’s bowl and let your hungry pet devour it. We sincerely doubt there will be leftovers. In the unlikely event that there are, the same rules apply here as with the sardines. You can refrigerate your leftovers for a maximum of three days, but then you should dispose of them safely. When disposing of them, remember not to put them into a bag your cat can easily shred, or a bin that they can easily fish the leftovers out of. When they have a taste for this, they’ll likely go looking for it if they can smell it elsewhere! Yes, we know ‘beef and cheese’ sounds a little disgusting when you see it written down. It’s easy to forget that when you take away the bread, beef and cheese is actually all a cheeseburger is. We’re not suggesting that you serve a cheeseburger to your cat, and nor will this dish resemble a cheeseburger when you’re done cooking it. Your cat won’t care though – it’s sure to love it. This is a little more complex than the other two recipes we’ve looked at so far. We’re stepping the difficulty up a level at a time! Half a cup of ground beef. Once again, and at the risk of sounding like a broken record, remember what we said earlier. Do not buy ground beef. Just buy beef, and grind it yourself. It’s much safer for your cat. It also strangely feels more rewarding for you when you serve the meal. Just don’t expect compliments to the chef from your cat. They’re also lousy tippers. Why do we bother? Six tablespoons of alfalfa sprouts, minced. Half a cup of brown rice, steamed (this is vital for texture and consistency). Three quarters of a cup of cottage cheese, small curd. We apologize if you can’t stand cottage cheese, but we promise it works really well in the context of this recipe. We’re going to do a little cooking here, as you probably guessed. You could serve raw beef to your cat, but to make this recipe work it has to be at least a little cooked. Find a frying pan, throw in your raw beef and cook it until it’s browned and drained. Don’t go overboard – you don’t want to fry it – once it’s got a brown coloring it’ll be fine. Give it time to completely cool down – you don’t want to serve it to your cat hot. When that’s done, put the beef with the other ingredients in a bowl big enough to accommodate them all, and mix them in together thoroughly. There should be no separation between them by the time you’re done, they should all become one whole. Again, you’re looking for roughly the consistency of wet cat food – something that clumps together in a soft mound. When you’re happy with it, serve it and see if it meets with your cat’s approval. Once again, it’s safe to store the leftovers in your refrigerator for no more than three days. Now we’re really going to turn it up a notch! If you’ve been trying these recipes out stage by stage, we hope you’re doing well with them. Even more importantly, we hope your cat loves them. We think this one is likely to be their favorite, and so we’re saving the best for last. It’s a little more advanced once again, and it will feel a little like you’re preparing food for yourself. You could actually eat this if you wanted, and you may want to taste test it to make sure that it’s of the right quality. Half a pound of rabbit meat. Cut this into small pieces – small enough for a cat to comfortably pick up with its mouth and chew. Vegetable stock – the unsalted kind. Cats don’t deal well with salt, and we don’t want to introduce any into their diet beyond what’s necessary. Double and treble check the label before using it. Half a teaspoon of olive oil. A pinch each of thyme, parsley, marjoram and rosemary. This is for both taste and aroma. A combination of peas, carrots, sweet potatoes and celery. You can use one or all of those ingredients, and in any combination you like. Just don’t use more than twenty grams in total of your chosen selection. We’re really going to test your cookery skills here! The first thing you need to do is saute the rabbit in the olive oil. Sauteing involves high heats, small pans and minimal fat. If you’ve never sauted anything before, we suggest that you practice a few times by cooking for yourself before you try doing so for your cat! Next up, sprinkle the herbs over the sauted rabbit and add in the vegetable stock. Bring the whole mixture to a boil. As soon as it reaches boiling point, turn the heat right down and allow the whole mixture to cook thoroughly, keeping a close eye on it as it does so. You can use this time to chop your vegetables. When you’re happy the mixture has cooked, put it in the oven with the chopped vegetables and leave it on a low temperature for around 45 minutes. That should get the whole meal thoroughly cooked without destroying the protein and nutrients in the rabbit. After 45 minutes, take it out of the oven and let it stand (somewhere your cat can’t reach it) until it’s cooled down to room temperature. It’s now ready to serve. The stew may be a little lumpy, as stews sometimes are. If it’s too much for your cat to handle, you can always put it into a food processor and smooth it down for them. This will likely persuade them to eat more of the vegetables anyway. If there are leftovers – you guessed it – put them in the fridge and don’t leave them there for any more than three days in total! Our intention with this page was to give you an insight into the pros, cons and risks of homemade cat food recipes. We hope we’ve given you a balanced perspective of the things you have to keep in mind, and the responsibilities you place on yourself by cooking for your cat at home. The recipes we’ve recommended are all ones that we know are safe, and represent a balanced meal for your cat. We have no hesitation in recommending them. Going back to what we said at the start of the article though, do check with your vet before starting any form of home cooking for your cat. There could be cat allergies or other health conditions to take into account. You and your vet know your cat better than we do (much as we’d love to meet your cat! ), and decisions on its diet are best made between you. If you liked this page, and would like to see more, let us know in the comments. We may add more homemade cat food recipes in the future!